We hope you enjoy this information and these photo slide shows as we travelled. Check out our YouTube channel as well. In 2017 we have made Umatilla, FL our Winter home. We are planning to travel for the Summer and plan to return in the Fall of 2018. Made some great friends here. 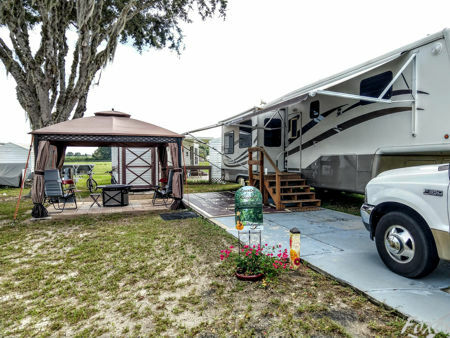 Oct 2018: we are back in Umatilla, FL at the Olde Mill Stream Resort. See the Music info on the right side of this page and come join in on the fun. Note: These Jams may be seasonal. Please check first. Every 3rd Saturday - Indoor Bluegrass Music Jam. Everyone welcome. Check with them for more music events. Every Friday at 6:30 PM Pizza Hut parking lot outdoor Bluegrass Jam. We have not attended yet but hear good things about this Jam. This is a first class jam. Jam night is one of the most popular and beloved nights at the Orange Blossom Opry. It is an open mic night, in which the general public is invited to come in and perform with the Orange Blossom Opry Band. Please view their website link above for further information. This Jam is in "season". About Nov 1st to Mid April. 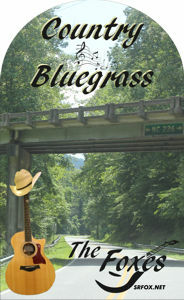 Just a fun Country and Bluegrass Accoustic Jam for all of us. Note: We have a security gate and you have to let them know you are coming to see Fox for them to let you in. Please note we have a 10 mph speed limit in the park that is strictly enforced. Note: As of March 20, 2019 this Jam is suspended till the 2020 season! Every day at 2-4 pm except Tues and Thurs. Located at the first RV on the right after entering gate.